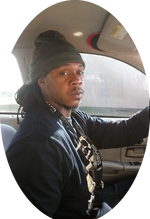 Mr. Jamal Maquail Raynor, 32, formerly of Goldsboro, departed this earthly life on Sunday. Mr Jamal Marquail Raynor was born on June 13. 1986 in Wayne County to Ms. Jocarol Raynor of Goldsboro, NC. Jamal grew up in Goldsboro, North Carolina where he attended Wayne County Schools. He was the grandson of the late Ozzie Raynor and the late Edward Garrett. Jamal was the life of the crowd, anything you said, or did he would always smile. He was a very caring person and If you could be figured out, he would figure you out. He had a heart of gold. If you needed the shirt off his back, he would give it to you without even asking if it was your size. Proceeding him in death were one son, Jy’Elle Maquail Raynor, two aunts Sandra Rawlings and Nancy E. Raynor. One uncle Gary Raynor. He leaves to cherish his memories, his wife and best friend, Mrs. Marquita Wade Raynor.Three sons, Master Jahyon M. Raynor, Jerry R. Wade of the home and Darnelle S. Little Jr. of Virginia. One daughter, Ke’Aviya J. Wade of the home. One brother, Jamie T. Raynor of Goldsboro., three uncles, Clayton (Oletha) Raynor, Douglas (Carolyn) Raynor and Decorrise Raynor all of Goldsboro, N.C. He also leaves his sister/cousins Ms. Catrina Raynor. Of Goldsboro and Latasha (Bakari) Green of Atlanta, GA. Mother-in-law, Dalphine Wade, one sister-in-law, Syntrella Wade. five brothers-in-law, Tony Wade, Keylon Wade, and Dayquell Dawson of Goldsboro, Demorris Jones of Louisville, Kentucky and Jeff Sanders of Selma, NC. and a brother/friend Daniel Jones, (special friends) Donte Davis and Johnny Jones, a host of nieces, nephew, cousins, family and Friends. To send flowers to the family of Jamal Maquail ""Mal"" Raynor, please visit our Heartfelt Sympathies Store.